I was browsing around the other night and read a girls blog where she made a card that fit 5 challenges. I should have written her blog down, but got distracted and then couldn't find it again. She needs lots of praise. So far I've only been able to get cards made that fit 2 challenges at one time. Oh well, practice, practice, practice. I try to do The Pink Elephant challenge each week. They have a soft spot in my heart because theirs was the first challenge I ever attempted, they have a great blog, pop on over and check it out, you'll like it. CNFS-Flowergal36-a card with flowers. I've had this stamp for quite a long time and each time I stamp it I think I'll add things to it, but these brads are as close as I have come yet. A simple card, but versatile for several occasions. 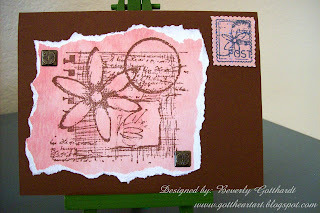 Supplies: 6" X 41/2" brown card stock, patterned pink card stock from stash, Ink: Ranger Archival Ink-Sepia, Ranger Distress Ink-faded jeans, Stamp: CTMH-C1264Lovely Daisy. decorative brads-Jo-Ann's, Scissors-postage stamp. SO happy to see you this week at TPE!! Good to hear you have a soft spot for us over at the Pink Elephant. It really is great when people keep coming back week after week you feel like you get to know them in a way. Love your entry this week. Glad you've come back Beverly! and with such a smashing card too! Welcome back! What simple, elegant card. Thank you for sharing your card with us for TPE's challenge this week!